Have You Found Your “Fitness WHY”? Somebody once said that my fitness level would actually put people OFF coming to me for training or to my classes. Maybe that is true to a certain extent because we can all feel intimidated by those whom we perceive to be better at something than we are. I would, however, hope that being fit and strong at my age would encourage people to set, and achieve, their own fitness goals. It is easy to look at a fit person and assume that they have “always” been that way; that it was somehow easier for them to achieve it than it would be for you. But this is usually not the case at all. Was I always as fit as I am today? No is the short answer. Whilst I always enjoyed dancing and doing home workout videos (a la Jane Fonda – yes I really am that old!! ), I definitely wasn’t as fit as I would have liked. The knowledge that we have today didn’t exist; there was no internet, with all the online programs and YouTube videos available, and things like HIIT and kettlebell training were not implemented in regular training programs – although the army would have utilised such things (kettlebells were used in the Russian army). Added to which, I injured my back before I had children, which limited what I could do (or so I thought). I tried all sorts of things to help it: Pilates, yoga, Holistix, but none of them really seemed to alleviate the problem – and subsequently being pregnant and lifting children definitely didn’t help! Was I always as strong as I am today? Definitely not. I didn’t do any kind of strength training when I was younger – which is such a shame. I really wish I had known more about it, but again, it just seemed to be something that only bodybuilders did, so wasn’t even on my radar. Any weights used in home videos were teeny tiny 1kg dumbbells! And, even with all the information we have today, still the fear perpetuates for women today that strength training means bulking up and becoming muscular and unfeminine (trust me – if it was that easy I’d be looking like Arnold by now!!) which means that so many women avoid it, or simply don’t challenge themselves with heavy enough lifting. Did I always commit to regular exercise? Well, yes and no… as I mentioned, I did home workouts such as Pilates and aerobics. I didn’t go to gyms but I sometimes went to classes held at places such as Pineapple dance studios when I lived in London. But once I had children I just did home workouts whenever I could fit them in (not that often once I had four boys to look after! ), as this was the most convenient for me at the time. And don’t get me wrong, I think home workouts can be a really viable tool, but knowing what will be effective is the key to success. And, of course, having the right equipment and enough space where necessary – although bodyweight workouts can be extremely effective and don’t require equipment or much space. Have I ever been injured? A resounding YES! As I mentioned above, I injured my back pretty badly years ago, lifting the battery out of my mini, twisting and slipping on the ice (and perhaps if I had been stronger and fitter I would never have had such an issue lifting it out in the first place!!). Pregnancies, and lifting children, took their toll on my back, and a C-section with my twins meant that my core strength was down the pan! In more recent years I had an Achilles injury, (which actually healed very quickly once I incorporated a collagen supplement into my diet). Then, about two years ago, I had excruciating pain in my right foot and knee, becoming painful to the point that I couldn’t go running, or do any high impact movements, and even walking my dogs every day was agonising. I couldn’t bend my knee to kneel on it, or turn out my leg from the hip because the knee hurt so much, which meant I couldn’t do yoga either. The one thing I could still do, which actually made it feel better, was kettlebell training. 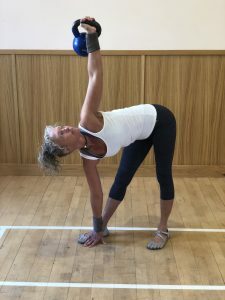 Strengthening all the muscles around the knee was so beneficial, and the ballistic action of swinging the kettlebell was promoting lymphatic drainage, which meant the build up of fluid was being alleviated naturally. I had an MRI and found out that I have a torn meniscus. I also had a Bakers’ cyst behind the knee, which was preventing me from bending it. I had ultrasound to break up the cyst, but was told they would do nothing for the torn meniscus as surgery can either often make things worse or would have no benefit. So I turned to my nutrition and my kettlebells and rehabilitated my knee myself. I would love to have another MRI now to see what it’s looking like as I have no pain and my squats are better than they have ever been! My knee does click sometimes, but this is because the cartilage cannot regenerate completely. However, I could so easily have given up and gone down the road of “oh, well, nothing can be done, this is the end of my career, I can’t do anything anymore, it’s my age… blah blah blah”. But I guess that’s not in my nature. Does that make me special? I don’t think so. I think we are all capable of rising above and finding ways around things. The body is an incredible organism and is constantly trying to heal itself – we just need to give it what it needs to be able to do so. That means proper nutrition, but it also means not giving up on movement. If you stop moving then you really are going to be in trouble. Once you stop it’s a downhill slide that gains traction and is difficult to halt. Have I ever had core strength issues? Absolutely! After my twins were born by C-section, that really affected my core strength – and exacerbated my back pain. It was a very slow recovery to be able to gain any kind of abdominal strength. I know what it feels like to not be able to hold a plank for more than a few seconds, or do leg raises without it being agonising, (back hurting and abs incapable of doing very many repetitions without having to stop), or do crunches and sit ups. Believe me, I have been there. But when you put the effort in it is amazing how your strength begins to develop and the muscles begin to work again. A major part of developing my core strength and kicking the back pain for good was training with kettlebells. They have just been amazing for really changing my body shape, helping me get stronger generally, and strengthening my core: my back, glutes and abdominals. Could I always do 100 burpees or 100 single arm kettlebell swings? No, of course not – and even now they are challenging – as they should be! High intensity training is hard, it’s challenging. But the beauty of it is that everyone starts at their own pace, becoming more able the more they do it. It’s never easy (it shouldn’t be or it loses the whole point), but you get stronger, fitter and better. So, as you can see, I totally understand how hard it can be to incorporate a fitness routine into your life, whether due to time restrictions, injury, perceived ability or worried about where, and how, to even get started. But it is not impossible. The simple fact is that we should all be moving a lot on daily basis – that’s a basic human requirement. However, many people just aren’t reaching even the minimum steps (10,000 per day) set by the government. All too often we are sitting at desks at work, sitting when commuting, sitting in the evenings and it’s no wonder that we have no energy to actually feel like jumping about or lifting weights at the end of a long day of not moving. I know – I spent a month doing jury duty a year ago and had a real taste of sedentary, commuter life – you can read more about it here. Being more active is also an important element to build into your weekly routine – and this is different from actual dedicated exercise. Activities can be shared with friends and family, they should be fun and are not actually geared towards any particular goal. Cycling or walking to work instead of driving if you are close enough, spending time playing in the garden with the kids at the weekend, a family bike ride or swim session at the local pool, playing Frisbee in the park with a group of friends. These are all part of being active on a regular basis and will help towards staying healthy. It’s also the best way to be good, healthy role model to your children. But structured exercise is often the element where most people struggle. When you think about starting an exercise program it is really important to dive deeply into WHY you want to do it. It is not enough to simply state: “I want to lose weight”. Exercise is not the magic road to weight loss – far from it – in fact if that is why you are engaging in exercise you will likely be sorely (pun intended) disappointed. Your weight is regulated by your hormones, which are affected by what you eat. There are many people who have been trudging to the gym for years on end, doing the same old thing – and yet looking exactly the same. Weight loss happens in the kitchen – making changes to your nutrition is where you will see the weight come off. And if weight loss is a goal for you, diving more deeply into why this is important is crucial to you achieving success. Why do you want to lose weight? What will improve in your life? Why is that important? Keep asking the question why until you get to the real nitty gritty of what it is you really want. A new review paper published in Annals of Medicine, confirms the critical role muscle mass plays in health. Studies demonstrated that people with less muscle had more surgical and post-operative complications, longer hospital stays, lower physical function, poorer quality of life and overall lower survival rates. Suggestions are being made that muscle mass should actually be part of our health system, as important as other vital signs, in evaluating a person’s health status, especially if they are living with a chronic disease. We undertake structured exercise for a reason, but you have to know what that reason is – your WHY. Digging deep into the reasons that you believe exercise to be an essential part of your life will help you to stay focused and consistent. I want to be able to participate in all life has to offer without worrying if I will be able to be strong/fit/mobile/flexible enough. I want to be able to run about with my grandchildren (when they eventually arrive in this world), I want to be able to lift them high into the air, whirl around and jump on the trampoline with them, without fear of falling and breaking bones or that my heart isn’t up to it. I want to be able to sit down on the floor and get back up again easily – preferably without having to use my hands as supports. I want to be able to climb a ladder to fix things or easily carry a 20kg bag of chicken feed on my shoulders up to the field for my feathery friends. I want to be able to squat down to pick something up from the floor (or stay there for a while should I choose to do so) without my knees or hips hurting. I want to be agile. I want to be as nimble as I can be. I want to be as fast as I can be. I don’t want to be huffing and puffing climbing up stairs or on a walk. I enjoy it! I love the feeling of having achieved something challenging, something that I didn’t think I could do, of getting better at something. All this I want – for as long as possible in my life. I won’t accept anything less and so yes, that means that I have to make damn sure that I work for it NOW. That I put in the effort to keep my joints healthy and mobile, that I retain – and gain – muscle tissue, that I don’t store unnecessary body fat, that I keep moving every day, that I lift heavy things on a regular basis and spend less time sitting. All this means getting uncomfortable for a period of time every day. But stepping out of your comfort zone is where the real magic happens. Challenging your body to do things that you didn’t think was possible. TRYING. I may struggle and be unsuccessful in my attempts sometimes, but that’s ok. Some days are harder than others to be motivated – it’s normal, but that’s when you have to remember your WHY’s. Ultimately, fitness is freedom – to live your life the way you want – to do the things you want to do and to do the things you have to do. Getting up off the floor easily, surviving a fall without breaking anything because your bone density is good, lifting your bag into an overhead locker, running for a bus without feeling like you are going to pass out, climbing a flight of stairs without being out of breath. To not be limited in life’s choices because you aren’t fit enough – this is freedom. At the grand old age of 51 I am the fittest and strongest I have EVER been – and getting fitter and stronger every day because I CHOOSE to continue and set challenges for myself. WHY? (And there’s that question again). Because feeling strong and capable is just the best feeling in the world. Being independent and not having to ask anyone to carry something for me, or wait for me because I can’t keep up, is important to me. Keeping myself injury free as much as possible by keeping my muscles, joints and bones strong and healthy. Feeling really alive. Any movement is good movement in my book, but unfortunately there is a lot of argument in the fitness world about what is best, what to avoid etc…that actually complicates the issue. There are specific elements that will develop your fitness in different ways because they address different areas of the body and different systems within it. So, for example, a cardio class will keep your heart rate at a steady pace throughout, helping you to improve your cardiovascular health (think heart rate and breathing), your stamina and endurance. Strength training has a multitude of benefits including cardiovascular (you will be amazed at how your heart rate will elevate during a session of strength training), developing muscular strength (and that doesn’t mean becoming bodybuilders ladies! ), developing a really strong core, helping to prevent – and rehabilitate – back problems, lubricating the joints and ligaments, ensuring they stay strong and mobile. High Intensity Interval Training (HIIT) will really improve your overall oxygen intake (VO2 Max) and increase your fast twitch muscles. This helps develop speed and power, and will also have a beneficial impact on your endurance levels too. And although HIIT might sound difficult and scary, everyone can work to his or her own ability and build up over time. A Tabata, for example, takes only 4 minutes – you push as hard as you can in those 4 minutes and then it is over! And your 4 minutes may look very different to my 4 minutes in the beginning – and that’s ok because you will be pushing to YOUR max, not mine! The most important element really is to find things that you enjoy doing. If you don’t enjoy it, and it is a chore, then you simply won’t stick at it. So that means trying out different things – you don’t know what you will be good at or enjoy doing until you try it. Don’t let your perception of what something is be the over-riding judgement that prevents you from actually trying it. And it’s not just physical benefits that we will benefit from. 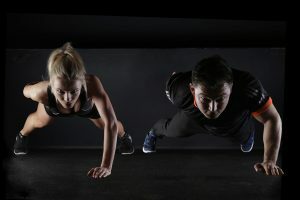 All exercise helps to produce mood-elevating chemicals in the brain, such as brain derived neurotrophic factor (BDNF), which enables existing brain neurons to survive and encourages growth of new neurons and synapses, aiding in learning, cognitive function, memory and higher level thinking. Exercise also improves mental health by reducing depression and anxiety. And recent research has revealed that exercise can have an anti-ageing effect because of the increase in mitochondrial function (the energy powerhouse in each of the body’s cells), and the ability to bolster protein production. Exercise can also improve insulin sensitivity, which is great news for those with Type 2 Diabetes, and has an anti-inflammatory effect. Sometimes the fear is that you are not fit enough to join a class – but isn’t that exactly why you should be joining a class? To get fitter! Our perceptions of what might entail within a class can often be completely wrong and, without going along and trying, how do you even know what you are and aren’t capable of? In my classes I make sure that there are always modifications, so that everyone can participate to whatever level possible for them. For example, someone may have fallen over whilst out walking and injured their hand, which limits what they may be able to do, so I will adapt certain exercises for them. Some people may have long standing issues such as knee, wrist or hip problems or they may be very overweight etc…most issues can be accounted for and adjusted so that everyone is capable of seeing success. Again, it is important to remember that everyone was once a beginner. I didn’t start out swinging a 32kg kettlebell, I started with a 4kg, just like everyone else that I teach. I developed strength over time by being consistent and determined. I couldn’t do leg raises very well because my core wasn’t strong at all and my back injury kept niggling, but with the different types of training that I incorporated regularly – particularly kettlebells – my core got stronger and my back got better, and my leg raises improved. Comparing yourself at the start of your fitness journey to someone who has been on theirs a long time is a fruitless exercise (excuse the pun again!) and who’s to say where you will be in six months or a year’s time if you stay the course? Health and fitness doesn’t have an end date – it is something we should be striving for continually throughout our life. So what are the key factors to fitness? Time – and this doesn’t necessarily mean hours on end at the gym. Effective training can be done in 20 minutes, which everyone has the ability to make time for in their day. Classes are great because they are motivating, sociable and can help keep you to a regular schedule. Making time for fitness is an important part of taking your health into your own hands. Consistency – this really is important as consistency means seeing real changes. If you only exercise once a week it won’t be enough to reap all the benefits that movement, activity and exercise have to offer. Consistency means incorporating these elements into your life regularly – at least 3 times a week, doing different types of exercise to really reap all the benefits they have to offer. Determination – challenging yourself and moving through the moments of being uncomfortable. Stepping out of your comfort zone is where change happens, where your body perceives that it needs to be better, faster and stronger to face the challenges that you are setting it in your daily life. As the saying goes: “Wake up with determination, go to bed with satisfaction”. The motto? Just. Keep. Moving. Have you found your fitness WHY’s? I look forward to your comments.